Become a freelance app developer or keep a steady wage? In Yeeply we enjoy being close and available to all our customers to ensure application projects are carried out properly and sum up to our list of success stories. But we also like to know our mobile professionals and experts personally: both businesses and mobile app developers. On previous posts we have introduced app developers in an interview format, as was the case with Rhasppsody’s COO. 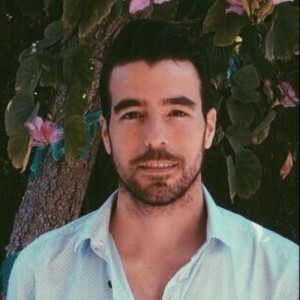 It’s now time to get to know Felipe Lloret Forner, a freelance app developer. Felipe Lloret Forner’s professional profile is copious and assorted, so just considering him an freelance programmer is falling short. Felipe is a telecommunications engineer and an air traffic controller, but on top of that he is also a web developer and an iOS programmer. He has worked programming PLCs, managing networks, ensuring that airborne aircraft stay away from each other and also as a CTO. However, he is now committed to the development of iOS apps and websites. We wanted to find out in this interview about his experience as a freelance app developer, his work as a creator of mobile apps and his relationship with Yeeply. ANA MOCHOLÍ – (Interviewer – AM): When and why did you decide to start developing applications by yourself? FELIPE LLORET (Interviewee – FL): My case is somewhat special. I studied Telecommunications Engineering and when I finished, besides two internships in a couple of mildly interesting companies, the expectations and offers I was finding didn’t match what I wanted. At that time, since I knew how to develop, I started working as a web developer and later jumped into the world of iOS mobile applications. I didn’t take it as a serious job at first, as it was rather a source of income while looking for a ‘real job’. As the labour market was not in its best moment, I sat public examinations abroad and went to Switzerland to work as an air traffic controller. My new job didn’t forestall me from developing and I continued working on personal projects, so I was still a freelance developer in my spare time. Due to a series of circumstances, I had to come back here and got a job as CTO in an R&D company in which I have already been over a year developing and directing several ICT projects. I guess that both the freedom regarding working schedules − to which I became accustomed during my recent years as a freelance programmer − and the job insecurity in Spain, led me to wonder if I could carry out more efficiently and productively as a freelance this very same work I was already doing for others. That’s the precise moment when I began to consider taking the leap and work full-time as a freelance app developer. AM: As a transition process, what were the next steps to take? Was it a complicated process? FL: At first, I spent like 2 months considering quite thoroughly if becoming a freelance app developer would be something worth doing or if I should rather stick to my previous job. I consulted friends and acquaintances who had already taken the leap and the advice they gave me was always the same: go for it. The process itself is not complicated. Becoming a freelance professional was something I was already familiar with, both when it comes to taxation as to making invoices, and the truth is that it hasn’t been a headache for me. The tricky part is finding customers and establishing projects. AM: Which obstacles did you find on your way to become a freelance app developer? FL: The only obstacle is the fear of leaving a steady wage behind for something that you don’t really know how it will turn out, but as everybody knows: who dares, wins. AM: In your opinion, what are the advantages of being an independent developer? And what are the risks of being a freelancer? FL: The independence you enjoy and the total control over your schedule. Also, the possibility of having a higher income than when working for someone else and the fact that when you have work to do you just get it done and when you don’t you just switch to other things and don’t have to remain idle at your workplace until you fulfil your office hours. The latter is something that happens in most jobs. However, the biggest drawback is that not getting work means not earning money. This insecurity often scares a lot of people when they are considering taking the leap to become a freelance developer and get to work on their own. AM: What’s your impression on Yeeply as a solution for searching app projects? Please tell us about your experience. 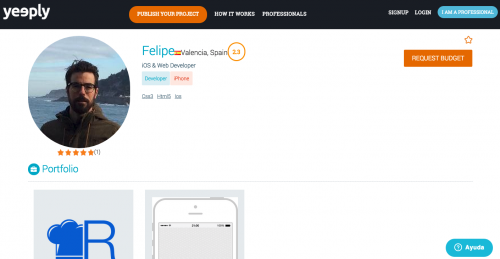 FL: Yeeply is an excellent tool to find mobile app projects. It makes a big difference for freelance developers, since projects are often filtered before being published and this increases the possibility of finding customers who are really willing to carry out their projects/ideas. In my case, despite being a newcomer to Yeeply, the experience has been very good. On the contrary to what happens when you finish a project outside the platform, with Yeeply you can be sure that, once the final result has been validated by both parties, the payment will be made immediately and you won’t be kept waiting by unbearable 30-day or 60-day payment policies. This somehow gives a lot of security and confidence to both freelance developers and customers. AM: What would you improve in Yeeply? FL: Yeeply is a young platform on which you are working very hard. In my opinion, one of the key areas for improvement is the ability to integrate new communication channels with customers to further enhance smoothness when it comes to negotiating and working on projects.